(AgWeek) – Robert Fraley, the executive vice president and chief technology officer for Monsanto Company, is the keynote speaker at 1:15 p.m. today at the 55th International Sugarbeet Institute at the Fargodome in Fargo, N.D.
Fraley will keynote the seminar topics speaking on, “Accelerating the Future of Agriculture.” The event draws hundreds of sugar beet producers from several states and features more than $5 million in products and exhibits. The ISI is free and runs from 9 a.m. to 5 p.m. and from 9 a.m. to mid-afternoon on March 23., with free parking. A second educational seminar topic is at 10:25 a.m., March 23, titled, “Know Your Airspace — Rules for Drone Operators and Unmanned Airplane Systems Update, Applications for Agriculture,” presented by Matt Henry, mission manager and pilot at the University of North Dakota in Grand Forks, and John Nowatzki, an agricultural machine specialist with North Dakota State University in Fargo, working together with the Northern Plains UAS Test Site. Fraley oversees the Monsanto’s global technology division which includes plant breeding, plant biotechnology, ag biologicals, ag microbials, precision agriculture and crop protection. He is credited with being the first to genetically-modify organisms in the early 1980s as “a solution for farmers battling pests and weeds that threatened their yields.” He was a World Food Prize laureate in 2013 and received a National Medal of Technology medal from President Bill Clinton in 1998. The “Accelerating the Future of Agriculture” concept is about delivering “integrated solution to drive long-term growth.” In August 2016, the company described that the core pipeline was expected to deliver $25 billion in net sales a fourth consecutive year of more than 20 advancements. The GMO issue is important to sugar beet farmers. 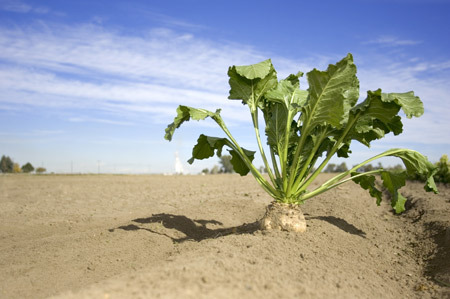 In 2007, U.S. sugar beet producers started using Roundup Ready beet seed, a GMO. The industry in the Red River Valley since then has become almost entirely Roundup Ready. After fending off various legal challenges against the technology in beets, the industry in the past few years has faced increasing pressure from candy manufacturers who say some consumers don’t want to buy products with GMO ingredients.